"Mama, can you teach us about optics?" Dr. Alexis Vogt, Endowed Chair and Associate Professor of the Optical Systems Technology Program at Monroe Community College, is no stranger to hearing phrases like this in her home. "Perhaps because of some brainwashing, my children love optics and have even mastered bedtime delay tactics with phrases like, 'How do you make glass, Mama?' My children are my motivation to work hard and create diverse opportunities for them to experience. What an amazing process to see the inquisitive mind of a child develop." Vogt, too, was introduced to optics at a young age -- building a five-foot periscope for a 6th-grade science project -- and promptly fell for the field. She received both her B.S. and Ph.D. in optics from the University of Rochester, and, upon graduating in 2007, went on to design contact lenses for Bausch + Lomb. 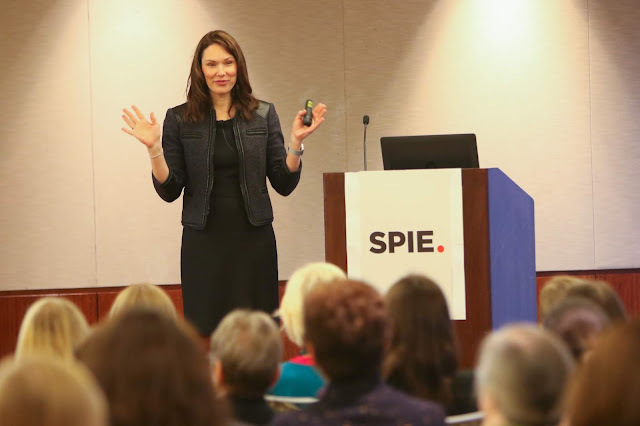 As part of her busy schedule, Vogt teaches courses for SPIE. She will be at Photonics West next week to teach the "Fundamentals of Optical Engineering" course: "Using hands-on demos, we will explore the fundamental principles of optics and how the principles impact our lives every day -- how optical fibers work, how rainbows are formed, and how our polarized sunglasses function." Enjoy her interview with SPIE's Faces of Photonics! 1. How did you become interested in the optics and photonics field? Was there a particular person who inspired you? My introduction to optics was with my dad when we built that five-foot periscope. I remember being fascinated by the mirrors and the bending light. But, as I continued through middle and high school, my interests included not only science, but also music and the humanities as well as social science disciplines. I entered the University of Rochester as an undecided major. During the second semester of my freshman year of college, I took "Introduction to Optics" taught by Professor Turan Erdogan. He became my inspiration: his ability to distill complex optics principles into a compelling and engaging way is remarkable. Following a career in academia, Professor Erdogan co-founded the optical coating company Semrock. He later became my manager and demonstrated that, in addition to being a gifted professor, he is a trusted, knowledgeable, and accomplished business leader. As a brilliant leader, family-focused, and faith-filled man, he has encouraged and motivated me since my professional optics career began. 2. Explain what you do at your job. How does your work impact society? 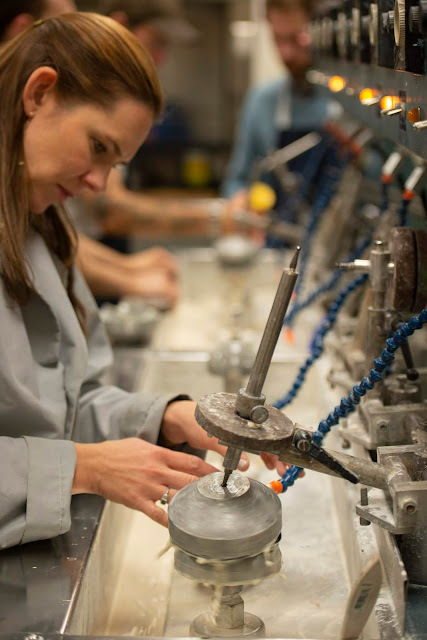 I am the Endowed Chair and Associate Professor of the Optical Systems Technology program at Monroe Community College (MCC), the nation’s oldest two-year degree program for training technicians to work in the optics and photonics industry. In addition to full-time teaching responsibilities, I was appointed to MCC to strengthen and grow its optics and photonics program. I cultivate community, business and industry partnerships to anticipate workforce needs as well as to promote regional and national economic vitality. 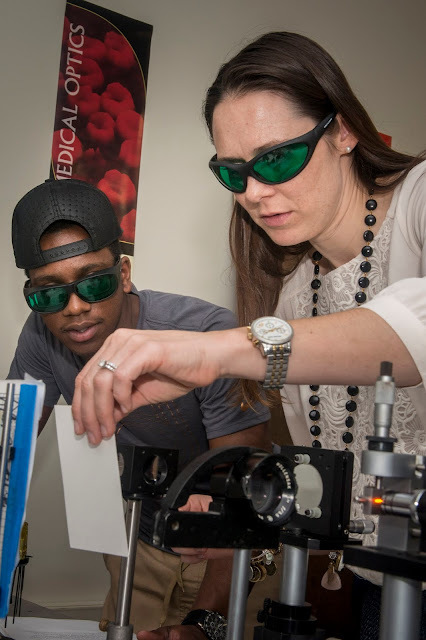 Motivated by the growing demand for optics technicians around the world, I focus on increasing the number of learners exploring, choosing, and completing optics and photonics programs of study. As I develop our optics program to meet the increasing regional and national optics workforce demands, I want more families to encourage their children to pursue interests in science and physics, especially their daughters. My all-time favorite text came from my husband a few years ago: “Your three-year-old daughter just said 'diffraction grating'!” I hope the work I do inspires kids, particularly more girls, to pursue STEM-related -- and hopefully optics -- fields. 3. What is your advice to others in the STEM community? We all know we are part of an incredible, innovative community, but we must increase and diversify our membership. We need to find passionate students and encourage them to take up careers in STEM, particularly in the optics and photonics fields. More recruitment and outreach activities geared toward historically underrepresented populations including women, veterans, African Americans, and Latinos, will expand awareness of those fields. to take up careers in STEM, particularly in optics and photonics." By expanding that awareness through presentations to middle- and high-school students and guidance counselors, more students will recognize the opportunities to join our exciting, growing field and will help us diversify the STEM community. Please grab your optics and visit your local library, science museum, or school and tell people in your community what you do!